Since 2011, the industry has recognized and honored an AAHomecare member for outstanding service to the HME community. 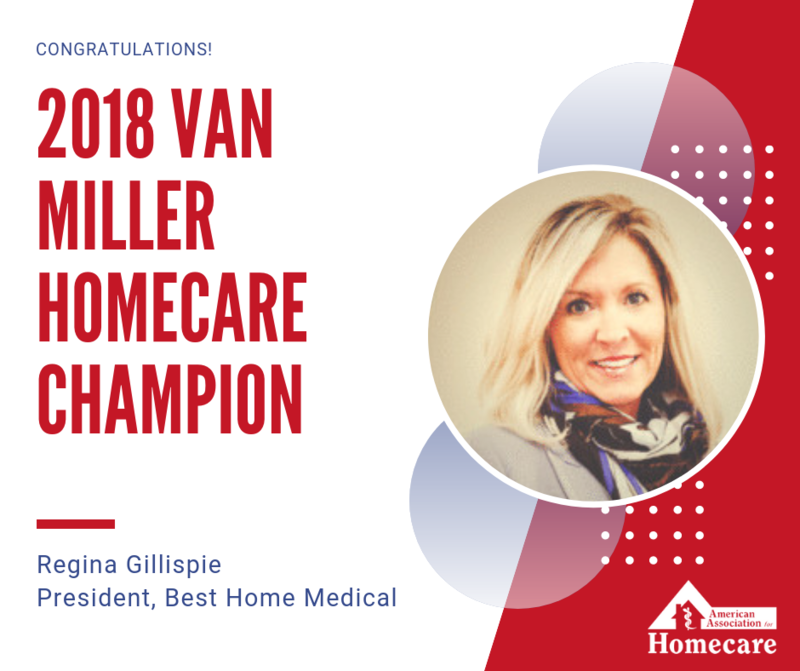 This prominent award was renamed in 2016 to reflect the characteristics of an HME visionary, Van G. Miller, past CEO and founder of the VGM Group, as well as a previous Homecare Champion. Regina Gillispie, President and Owner of Best Medical, has an exemplary track record of directly educating and engaging her representatives in Congress – and mobilizing her HME peers in West Virginia to do the same. She has been a consistent presence at our annual Washington legislative conference, leading the West Virginia contingent and personally setting up meetings managing the schedule of her team. This year, she built on those efforts by convincing the entire West Virginia Congressional delegation – their two Senators and three House members – to sign on to a letter to CMS Administrator Verma asking for additional relief for rural and non-bid areas suppliers in their rulemaking. As part of this effort, she even enlisted state Medicaid officials to help make the case that current reimbursement rates were impacting patients and hospital discharge planners in rural areas in the state. Regina has also been at the forefront of several state-level policy wins, helping convince West Virginia Medicaid to mandate that MCOs honor the timeframe of current authorizations for patients under previous MCO plans, as well as securing a 24-month timeframe for recoupments for MCO plans. She also had played a leadership role in getting the state to increase oxygen reimbursement rates. It takes a lot of passion, persistence, and capability to get Congress and the Administration and State officials to make substantial policy changes – and it’s HME providers like Regina, who are essentially taking on a second job as a public policy advocate – in addition to their demanding jobs running a successful HME company – who move the needle and allow the HME community to get some wins in Washington – ultimately helping protecting the viability and future of this industry. We are finally turning the tide on the bidding program and reimbursement rates on Capitol Hill and at CMS – and we’re also having success in many states – and it’s because of dedicated HME pros like Regina Gillispie.